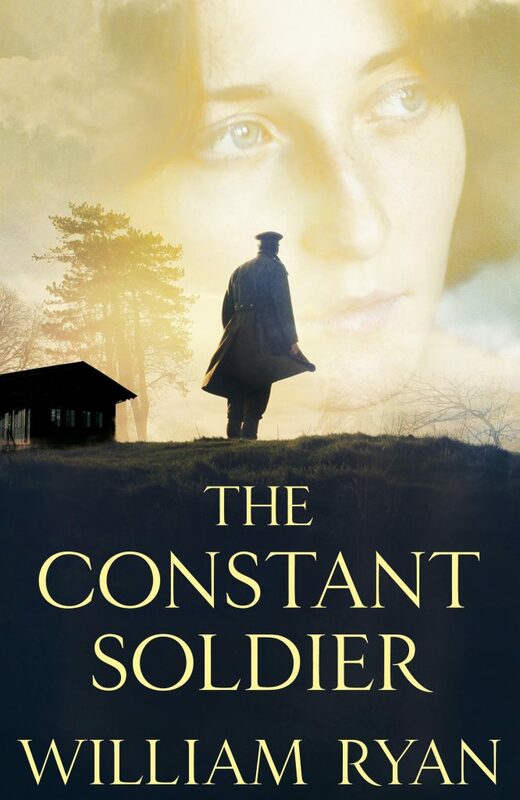 The Constant Soldier is based on a series of photographs taken between June 1944 and January 1945 in what was then Nazi Germany. They were taken by the adjutant to the Commandant of Auschwitz – Obersturmführer Karl Hoecker. The Hoecker photographs came to light in 2007 when they were donated to The United States Holocaust Memorial Museum (who have kindly given me permission to display them) by an anonymous donor. They were originally found in 1945 by an American officer in a bombed out Frankfurt apartment. 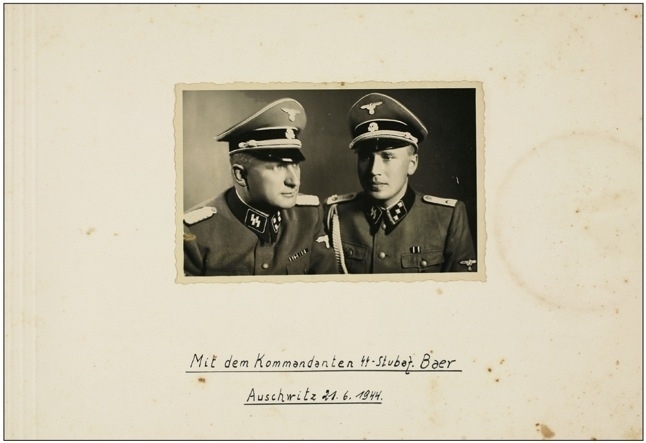 This is the opening page of the album, where Hoecker poses for a studio photograph with his superior, the commandant of Auschwitz, Richard Baer. It is very striking, in some of the photographs, how ordinary some of the people in them seem. Except that they aren’t ordinary at all. From left to right in this photograph are Richard Baer, then commandant of Auschwitz, Dr Josef Mengele, responsible for some of the worst of the Auschwitz medical experiments, Josef Kramer, known as The Beast of Belsen for his involvement in the horrors that the British army uncovered when they liberated that camp, Rudolf Hoess, the first Commandant of Auschwitz and Anton Thumann, who was responsible for terrible crimes at Majdanek and Neuengamme. 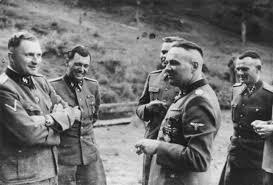 It looks as though Hoess might be imitating someone while Mengele and the others are smiling in response. It could, without the uniforms, be an office day out. Hoess, Thumann and Kramer were executed in the immediate aftermath of the war and Baer died in custody in 1963. Mengele, of course, escaped any responsibility for his crimes. 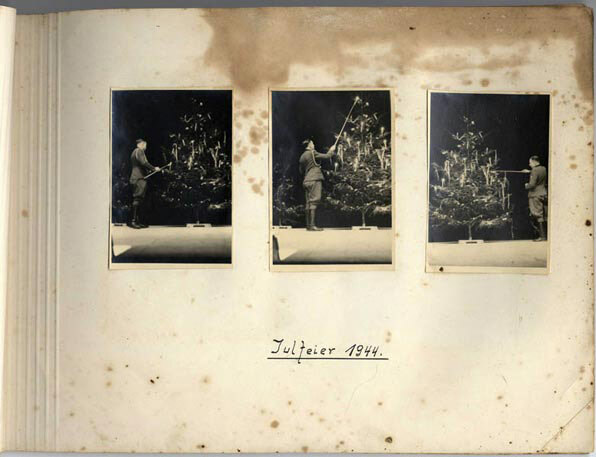 Three photographs in the collection particularly interested me – they’re of Karl Hoecker lighting the candles on a Christmas tree in 1944 (this is one of them). The Soviets attacked in January 12th and Auschwitz was liberated on January 27th – only a few weeks after the photograph was taken. I was curious as to what must have been going through his mind. I would imagine he must have expected that there would be retribution for his involvement in Auschwitz. But I also wondered whether he felt any guilt – and whether he wondered how he had come to this point. Before the war he had worked as a bank clerk but through a series of decisions, not all perhaps of his making, he had become involved in mass murder. There can be no excuse for his involvement but perhaps, at this moment, he was having to face up to the consequences of his crimes. Another photograph, taken at a driven shoot in January 1945 – literally days before the Soviet offensive that would liberate Auschwitz a few weeks later – also interested me. In it, Hoecker’s smile seems forced. By this stage of the war, there can have been little doubt in most Germans’ minds that it was lost. It was something I wanted to explore – this shift in the balance of power, the moment when the murderers became the hunted. I wasn’t quite certain how this novel would turn out, but I began to think about what the story might be. It was also interesting to me that very few of the photographs in the album were taken in Auschwitz – there are some of the opening of a SS hospital which was built there, and some of a funeral which took place in the town. But there are none of the camp and none in which we see prisoners or any of the horror that must have surrounded Hoecker. 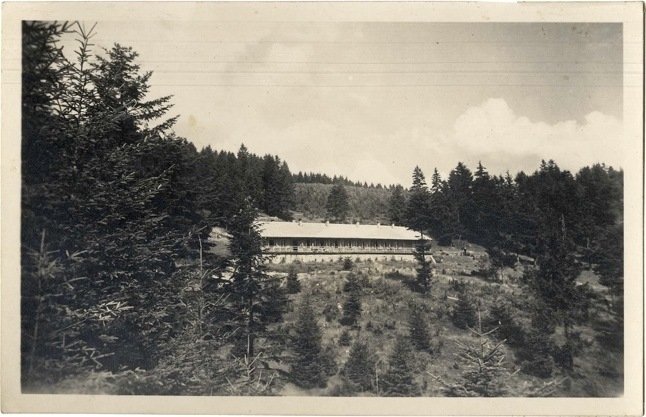 Many of the photographs were taken at a rest hut for the officers and men who worked in the camp, located in the hills not far away. This rest hut is where much of the events in the novel take place. In the novel I made it much more luxurious than it probably was in fact. I wanted it to be a bubble of comfort and calm in amongst the chaos of a disintegrating Nazi Germany. The hut was located near the village of Porabka, in a part of Upper Silesia that had been part of the Austro-Hungarian Empire until the end of World War One, then part of Poland between the wars, before being incorporated into Nazi Germany in 1939. The area had always had a substantial German population, since at least the middle ages, as well as Polish and, of course, Jewish. The area was Aryanized following the Nazi invasion with the Polish population either being assimilated or expelled, while the Jewish population was resettled in the Lublin Ghetto before being murdered in Auschwitz. I wondered what that must have felt like to people who had lived there for generations – to witness their neighbours being forcibly removed and to be aware, constantly of their absence. And by 1945, by which time most Germans had some sense of the horrors inflicted on the civilian population in the Soviet Union by German forces, the German population must have rightly feared the future. The Polish and Jewish populations had been removed in a matter of days. 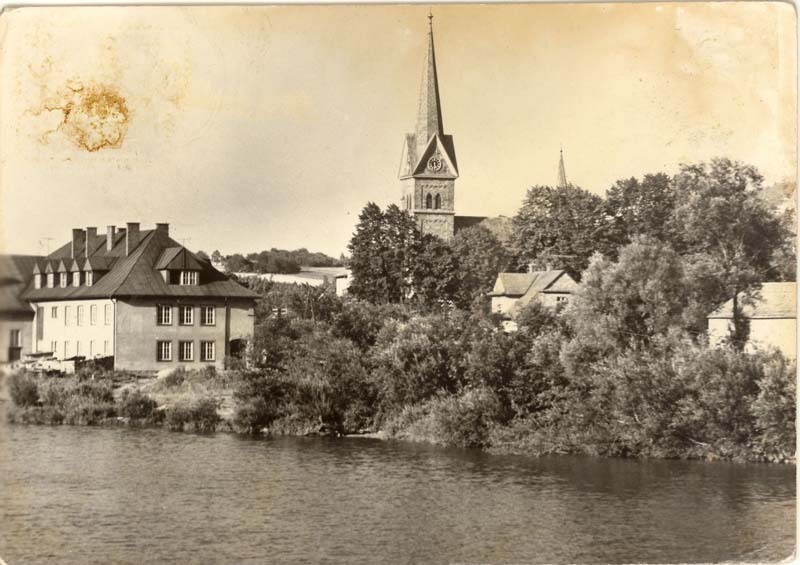 This is a photograph of the village taken between the wars, when Jews, Germans and Poles lived side by side. It is strange to think that, by the end of the 1946, nearly everyone in the village would have been forcibly expelled or, in the Jews’ case, murdered. This is a picture of the valley and its lake. The village of Porabka can be seen at the end of the lake, below the dam (the white line across the water). 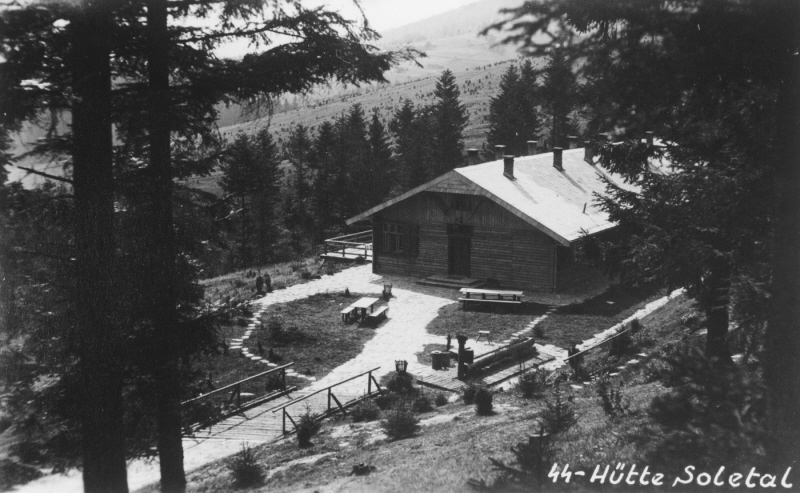 The hut was located on the left hand side of the photograph, on the western slope of the valley – but the fictional version in The Constant Soldier is on the eastern side. The dam was built by the Polish government between the wars, designed to regulate the Sola River from bursting its banks and flooding the pl. One of the reasons I wanted to have the fictional hut on the other side of my fictional valley was so that it would be necessary for its occupants to cross the dam when the Soviets arrived. Because the crossing happens in mid-winter – the Soviets reached the valley in late January 1945 – I imagined my fictional lake to be frozen. It’s difficult to tell if the lake is frozen in this winter photograph. But it might be. 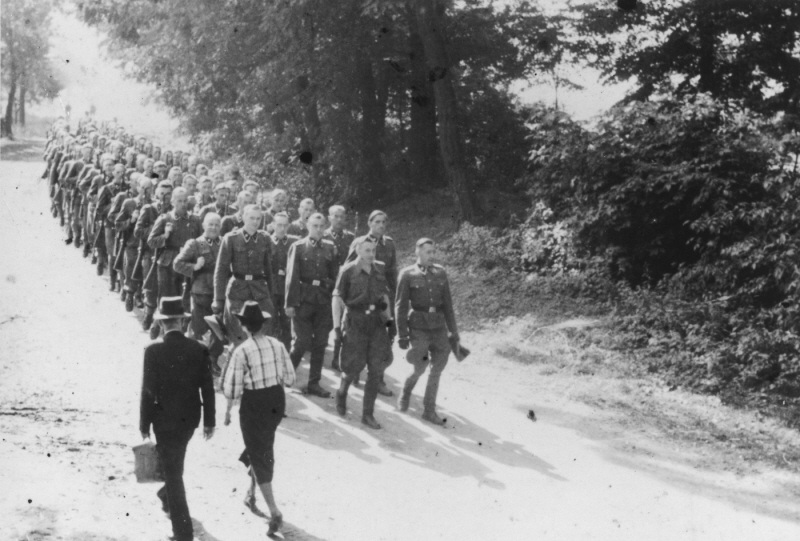 This photograph, of a column of marching SS men with Hoecker at head of the column, was probably taken close to Auschwitz rather than in the valley where the rest hut was located. It interests me because of the two civilians passing on the other side of the road. I wondered what the civilians, who must have known about Auschwitz, thought about the SS. Were they frightened? Or were they, perhaps, supportive? You can’t tell from the photograph whether the civilians are German, or Polish. But, if they were Polish, then they must have felt terrible fear. 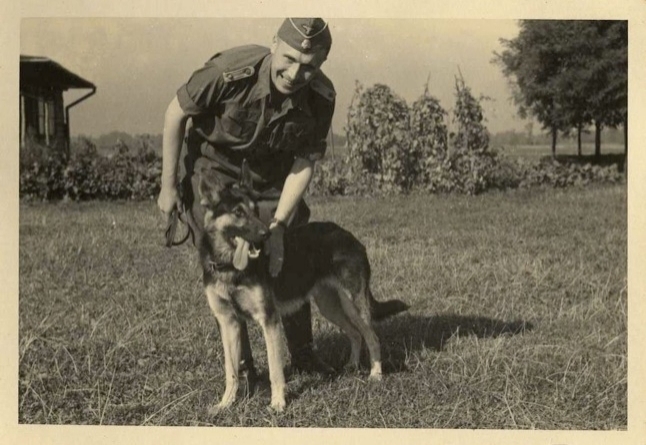 This Summer 1944 photograph is of Karl Hoecker, the owner of the album. He’s playing here with his pet dog, Favorit. 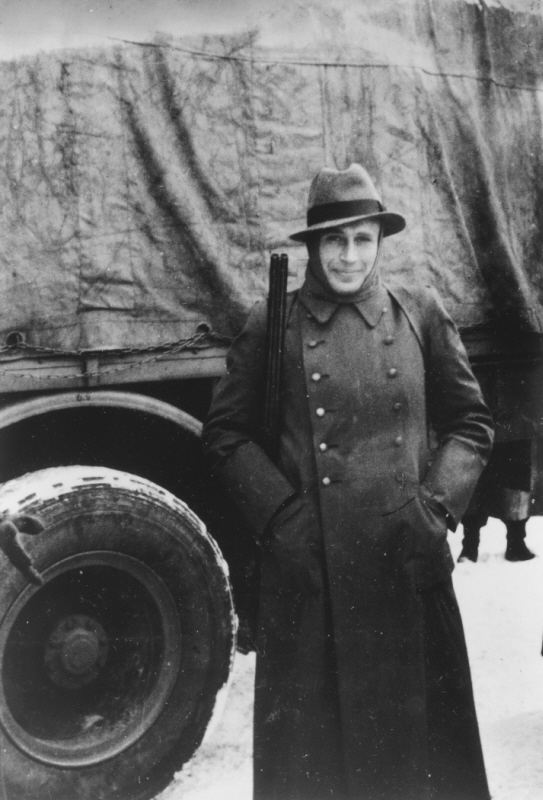 Before joining the SS, Hoecker had been a bank clerk – a job he returned to after the war.